Big B of Bollywood beckons one and all to spend at least two days in Gujarat to feel the fragrance of Modiland. A 56-inch chest-thumping Narendra Modi woos the voters of Banaras saying, "Give me 60 months as Prime Minister, I will end all the woes of the weavers by setting up artificial silk making powerlooms just as in Surat,"
Arvind Kejriwal decides to spend not just two but four days in Gujarat to get a whiff of the fragrance AB is talking about in his multi-crore-rupee TV commercial, 'Khushboo Gujarat Ki'. He comes to Gujarat as a common man. There is no frill of flags, banners and loudspeaker. He travels in a car to North Gujarat, Saurashtra and Kutch, meeting village folks, men and women. He listens to them patiently, taking notes painstakingly. A posse of policemen, in uniform and without, trailed him, walkie-talkie in hand, reporting his minute-to-minute movement to the 'Saheb' in Gandhinagar. Kejriwal stops at a village, some 100 km from Ahmedabad, to meet about 50-60 men and women who tell him about widespread corruption they encounter in their daily life, about schools that have closed down in the absence of teachers, primary health centres that have ceased to exist as there are no doctors or nurses to attend to the patients, their farm land taken away and handed over to big industries, the norm of taking bribe money by police and revenue officials. At a couple of crossroads, a dozen-odd men wave blag flags at him and shout, "Kejriwal, go back". Kejriwal moves on but is stopped by the police and taken to a police station at Radhanpur. "You have violated the model code of conduct of the Election Commission by your roadshow without taking prior permission," the officer in-charge of the police station tells him. "There is no roadshow. I am not carrying flag, poster, pamphlet, nor am I making any speech," he counters. "But, you are obstructing traffic," the police changes track. He is let off after 15-20 minutes of argument. As Kejriwal enters Kutch, a mob of 30-40 men block his way, smashes the windscreen of his car and scoots. Police watch from a distance. Kejriwal had not come alone on a visit to Gujarat for a reality check. Over 200 fellow volunteers of the Aam Aadmi Party too had come. They had spread out all across the state - North, South, East, West - in an effort to find out the truth of Gujarat. Most of them were not known faces. They went unnoticed by Modi supporters and police. Manish Sisodia and Gopal Rai were not lucky. The vehicles they were travelling in were attacked and their local hosts harassed by the police. His fact-finding mission over, Kejriwal and his army of investigators returned to Ahmedabad. After holding a press conference where he disclosed his findings, Kejriwal wanted to meet Narendra Modi for a 'chai par charcha' on 16 questions he had for the man with a 56-inch chest. 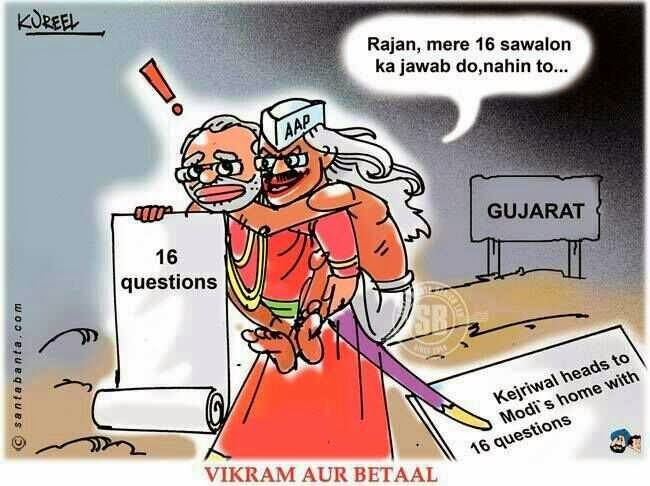 Five kilometres before he reached Gandhinagar, the state capital, to meet Modi, Kejriwal was stopped by the police. Over a hundred BJP workers too had positioned themselves to prevent Kejriwal from going further. "Why is Modi afraid of meeting me? I am not a terrorist. I am a common man. All those present here who have had the chance to meet Modi ever in their life, please raise your hand," Kejriwal asked at the public meeting in Ahmedabad attended by over 50,000 people. Only a couple of hands were raised. "I am open to meeting Modi any time any place," he said. "Modi, Modi, Modi, Modi", a group of over two dozen men raised a cry in unison from the left side of the stage from where Kejriwal was addressing the meeting. "Please come up on the stage, any one of you to answer my questions," he challenged the sloganeers. All of a sudden, stones started flying, aimed at the stage. Lathi-wielding policemen, chased the protesters who disappeared into a narrow bylane. Continuing his speech, Kejriwal said, "Modi is a liar. He paints a rosy picture of Gujarat before the country. All lies." He then gave out details from his notepad nailing Modi's lies about development on various fronts. "He has benefited only the Ambanis, Adanis and Tatas, Ruias, working as their property broker. Taken away land from the farmers and gifted his cronies to expand their empire. He has destroyed small and medium scale industries. To facilitate easy access to the corridors of power, he has made Sourabh Patel, the son-in-law of Ramnik Ambani, a cabinet minister with petroleum and energy portfolio." "There is rampant corruption even at the lowest rung of the bureaucracy. Modi has encouraged the practice of employing contract workers as teachers, constables, nurses, forest guards, so that they are exploited and poorly paid. Unemployment has increased manifold. Hundreds of farmers have committed suicide. Agriculture production has declined." "If Modi succeeds in becoming the Prime Minister, the gas price will double from the present four dollars per unit to eight dollars whereas its production price is just one dollar. This will lead to increased price of fertilizer, electricity and transportation. All this to fatten the purse of Ambanis and Adanis," he said. He ended his speech reiterating his demand to meet Narendra Modi to seek replies to his questions on "Khushboo Gujarat Ki."